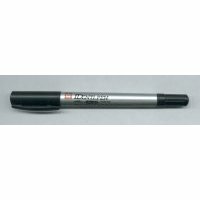 Permanent ink, dual point, black marking pen. One end has a fine point and the other end has an extra fine point. Felt-tip. Won't come off during grinding.